These days, it seems that you have all the entertainment you need at your fingertips. Wherever you go, you are sure to see people enraptured by their mobile devices, scrolling through videos on social media or streaming their favorite TV shows. There is no shortage of convenient entertainment, which certainly creates problems for those involved in the performing arts. So, how do you begin to compete with convenience and draw an audience into the theater? If you are Cerqua Rivera Dance Theatre, you have found a solution – create a unique concert dance experience coupled with a live jazz band. CRDT is known not only for its high caliber dance and choreography but is equally recognized for its ensemble of musicians (whose credentials include international tours and album releases with Motown). 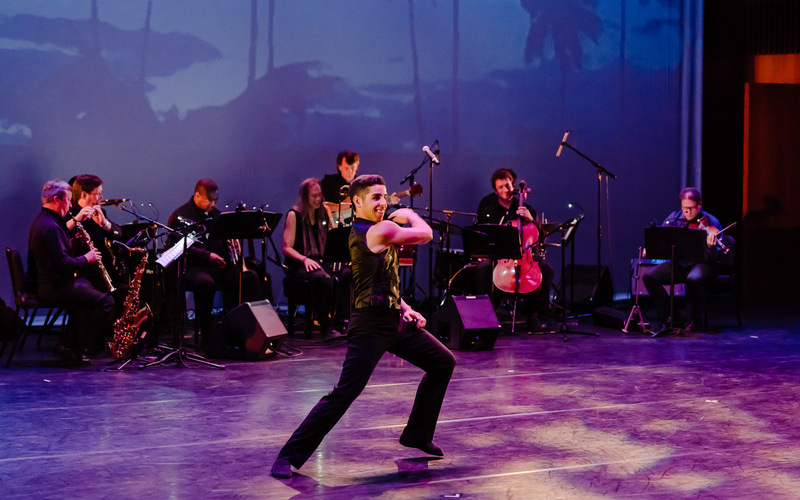 Better yet, musicians in the ensemble regularly collaborate with the dance makers at CRDT to provide lush, original compositions – a component essential to the magic that appears on stage. So, take some time and tear yourself away from the electronic screens in your life (after you finish reading this, of course) to experience Cerqua Rivera Dance Theatre’s 2018 Fall Concert Series. If some of Chicago’s finest concert dancers and musicians are still not enough to draw you in, consider the depth and care with which they approach and research their choreographic endeavors; the fall series includes the third installment of American Catracho, a choreographic research project which began in 2016 that explores the many facets of being an immigrant. The program also features a collection of works that stretch the artistic and technical capabilities of dancers and musicians alike. …instrumentally layered creations will carry audience members through the night and tie together the choreographed pieces the company will be presenting. Kristi: For its 2018 Fall Series, CRDT is presenting an array of new works with new musical compositions alongside a piece of existing repertoire. Can you tell us more about each of the pieces in the program and shed more light on the music? Richard: The program that Cerqua Rivera Dance Theatre has put together this season is one I believe to be the most diverse yet. It ties together an array of works that not only showcase the dancers, but also highlight the live music. This season, the band will accompany every single dance piece with original compositions created by different musicians within the musical ensemble. These instrumentally layered creations will carry audience members through the night and tie together the choreographed pieces the company will be presenting. These pieces include The Process Takes a Lifetime by Joshua Ishmon, ROOT by Monique Haley, American Catracho (Part 3) with choreographic contributions from Wilfredo Rivera, Noelle Kayser, and Christian Denice, and Sin Fronteras by Wilfredo Rivera and Hanna Brictson. Spoken word poetry and live music will guide the elements of segregation and the attachment to old memories that Catracho conceives through the new movement being presented. Ishmon’s The Process Takes a Lifetime reveals a more theatrical side of CRDT. The piece presents a narrative taking place in a household and consists of five dancers portraying members of a tight knit family. Guidance, frustration, and romance drive these characters as they interact with one another in hopes of molding the future generation. Monique Haley’s ROOT is dance at its rawest form. Stemming from African dance and rhythms as well as jazz dance, this piece dives into the earth to harness its vibrating power and move the dancers as they notice, reflect, and embrace this mighty sensation. American Catracho (Part 3) continues the immigration saga that Cerqua Rivera Dance Theatre has been creating since 2016. This season, the piece focuses on specific communities and how they personally go through the immigration process. Spoken word poetry and live music will guide the elements of segregation and the attachment to old memories that Catracho conceives through the new movement being presented. Making its comeback to the CRDT program is Sin Fronteras. The piece breaks the barriers that divide the world into disconnected locations while accentuating the beauty in diversity. It is dance that represents all parts of the world, exemplified by multi-cultural music composed by Clarice Assad. Nothing fills the heart of dancers and music lovers like being in the same room as incredibly talented musicians that induce such magnetizing music. Kristi: With the Fall Series featuring live music throughout, it must pose some unique challenges for the dancers. Can you shed some light on how the dancers at CRDT rehearse and prepare for this, as well as some of the challenges and advantages of performing to live music? Richard: The challenges and advantages of performing to live music completely fall in the order of events of the process. If the choreographer comes into the studio and uses digital music of their choice to choreograph, the dancers embody a specific essence to the movement and commit to recreating that feeling every time. Once the composed music is ready and is brought into rehearsal, the adaptation can be a big challenge. The dancers are already used to moving to a kind of sound that is not there anymore; then begins the task of sculpting. At times, this feels like starting from zero. All the movement must be redesigned to fit the music, and aspects like transitions, accents, and intentions are altered to match the new sounds to create a well-rounded vision. There is also the possibility that the choreographer has the composed music from day one. In this situation, the challenge lies in the tempo. Dancers will be rehearsing to the music they will perform to day after day, but they are practicing with digitized music that has consistent in timing. Once the band and the dancers come together, all artists must quickly stay on their toes and make sure to be mindful of one another. Sometimes the band is to slow or too fast, and sometimes the dancers are to slow or too fast. This is the risk we all take, but it is also what creates the magic and the vision that Cerqua Rivera Dance Theatre desires to share with the world. Advantages of live music? It’s live music! Nothing fills the heart of dancers and music lovers like being in the same room as incredibly talented musicians that induce such magnetizing music.